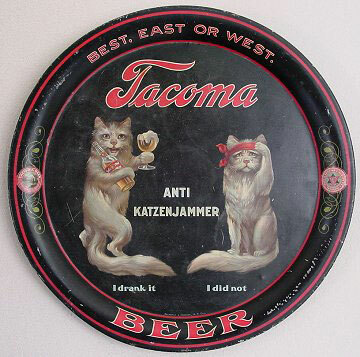 This tray for Tacoma Beer by the Pacific Brewery features two cats, one who drank Tacoma Beer and feels great, and one who didn’t and is hungover. This tray features the tagline “Best, East or West” on the rim and “Anti Katzenjammer” (which means anti-hangover) in between the two cats. This is a rare tray prized by collectors so if you have one then please Contact Us!, it could be very valuable based on its condition. This is a pre-prohibition tray that is 13″ round, has a black background with red text and decoration on the rim.